Ok, so I broke down and purchased a Sous Vide Supreme some time back and I've used it on a couple of bentos (one coming up this next week). And as with all of my gadgets I wouldn't be doing it justice if I didn't put up a post / review on the device. As a disclaimer: No I didn't get this thing for free, I purchased it with my own hard earned money (yes I had to save up for it). I'm writing this based of my opinion and personal usage no one paid or asked me to do so. No, I'm no professional chef, I just like to cook (a lot), play with toys, and be a general science nerd. I would hope that my idol (Alton Brown) would appreciate and approve of this exception I'm making for a single use tool in my kitchen. Down to business! Sous Vide what is it? This is actually a very lengthy topic and I could go on and on about it, but you could just go here and read the reliable details and do a lot of google searching. Here's the elevator pitch: If you want a medium rare steak (cooking conventionally) you need to heat the exterior to more than medium rare to get the heat into the center. What you end up with is a steak that is well done on the outside ranging into medium well in the center. What if, knowing the perfect temperature of medium rare for your subject, you could just bring the steak up to medium rare and hold it there, it would take a lot of time and a lot of precision to hold that perfect temperature. This is exactly what Sous Vide cooking techinique does. In the 70s french chefs discovered that precision temperature cooking preserved fat, flavor and textures. What better way to get precision tools than to raid your local science lab. So using immersion water circulators they produced a water bath that was held to the exact temperature they needed for various applications. The idea is to vacuum seal whatever your cooking with your intended seasoning and put it in this water bath to slowly come up to temperature. Since everything is sealed together you lose nothing to evaporation, the pan, or cooking liquid. Even better, you can hold it at this perfect precise temperature for long periods of time and finish your dish off as it's needed (a very good thing for restaurants). There's no such thing as over cooking if you never exceed the target temperature. You get the idea. Although developed in the 70's the practice of sous vide cooking hasn't really hit the mainstream until recently. Many famous chefs (Thomas Keller of French Laundry fame to name one) have embraced and extolled the virtues of cooking under in vacuum (see his awesome book "Under Pressure"). And of course there are many blogs dedicated to practice. Television has played it's role where sous vide is well show cased in a lot of cooking shows. The handy piece of equipment that makes this happen costs something on the order of $1500 to $2000. A bit steep for the home cook, a perfectly legitimate cost for a restaurant because of your ability to dish out slow cooked food on demand or simply hold things. This is where we come to our new exciting device the Sous Vide Supreme. This device is being hailed as a "water oven" that promises to bring the practice of Sous Vide cooking from the shows like Top Chef to home cooks. What do you get? This is a pretty simple looking device. It's a box with a nice simple to read digital display that lets you set both time and temperature and then it proudly displays the current temperature of it's contents. You get two racks one to lower your food into the water and another that holds the various pouches in separate from one another then there's a bunch of trial spices and of course the manual. And a foam mat that sits atop the device. There's a dvd but i'll confess I've still not broken that one out yet. The rack is important because the Sous Vide Supreme (SVS from here out) is not an immersion circulator, it basically surrounds a small volume of water with heat to provide it's precise temperature. So keeping your food from the walls or floor of the water oven is important. Also, having proper spacing between your bags insures that it's well surrounded by water. For my first trial I really had to try out the a sous vide steak. Rib eye and NY Strip, specifically USDA prime. As you can see we have some beautiful specimens. Four steaks for this trial, two are to be sous vide and two cooked via Alton Brown's method. Both seasoned with salt and pepper only. In this case, the steaks were approximately 1.5 inches thick so that meant two hours in the SVS and about four mins on stove and oven for the more traditional method. Both of course got 10 mins of resting afterwards. First the sous vide method. Simple sprinkle of salt and pepper on both sides and a seal in the FoodSaver and we drop it into a perfect bath of 134 degrees Fahrenheit. Wait for it to come up to temp and then we wait two hours. The waiting is probably the most painful part. But while we wait let me explain what we're trying to do here. The steak via the stove method introduces a lot of heat to the steak trying to bring the center of the steak to medium rare as quickly as possible to reduce how well you cook everything outside of the center. 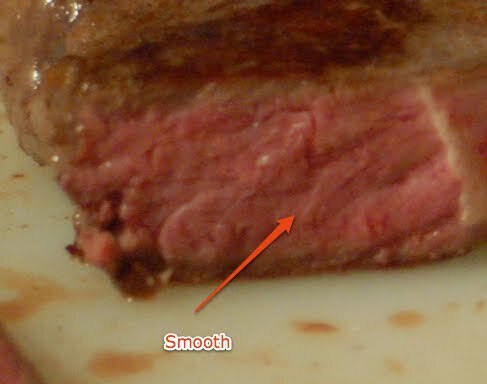 With sous vide cooking, since you're bringing it to the perfect medium rare temperature the *entire* steak is perfectly medium rare when it leaves the pouch. You're only searing to finish the steak to get the "Malliard Reaction" basically that yummy browning that's so desirable. In the end you get a small thin well done portion and a generally large surface of medium rare. Also because you brought it to the perfect temperature you are insuring the same results every time. Consistency is very important here I will say that since this trial I have cooked many steak dinners for my friends and each and every time the result is the same. Via stove, grill and oven, you are poking and testing because you have variables like grill temperature, slight thickness differences, finicky oven temperature (that works by giving you an average temperature). So the end score how did it all turn out? See for yourself, there are some obvious differences. Both pictures the NY Strip is on the left and the Rib eye is to it's right. The Left Picture is the sous vide the right picture is the stove/oven method. If you click in you'll notice the a few things. The sous vide steaks are definitely medium rare all the way thru. You see maybe a millimeter of brown right at the edge for the crust (that Malliard reaction I was talking about). On the right picture do you see that ring of brown? That's the well/medium well transition until you get the medium rare. It's size able, if you add it together i'm willing to bet/say it's a quarter of your steak that's not medium rare. Now the thing I can't show you is the difference in taste. This was the real shocker for me. The sous vide steaks were the most tender steaks I've had. ever. period. The texture is so dramatically different from the other steaks it's almost undescribeable, best thing I could say is silky smooth texture that still proclaims "BEEF". I've noticed this with chicken as well. but texturally it's softer. 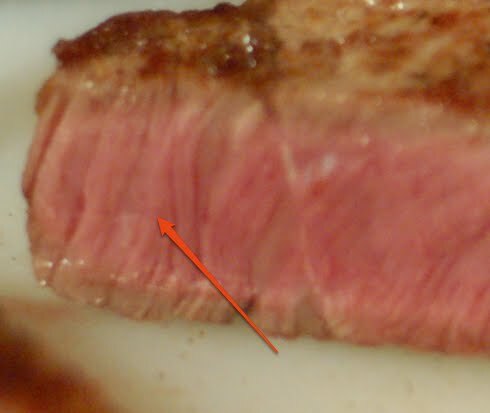 Perhaps a food scientist could help verify this, but you can kind of see this in the NY strips; the traditional you can see definite grain to the beef where as the sous vide does not. Does the over application of heat cause the muscle fibers to seize up? Dunno on that one, but in chicken (which i'll post later) you'll see the same effect. So bottom line verdict is it worth it? If I didn't have a blog and I didn't cook regularly, I personally would have a hard time justifying the $450~$500 price tag. Now given that I do cook regularly and love to tinker etc.. would I respend the money? yes in a heart beat. The results produced on the things I've cooked so far are super kickass. I currently have six chicken (was nine) breasts that were quick chilled and frozen in their cooking bags, when thawed still taste as tender and moist as when they came out of the SVS. I am a gadget freak but this was one cooking technique I've been dying to look into starting 10 years ago when I first heard about it. I'm looking forward to trialing various vegetables but all of my protein experiments have been stellar. My next bento will feature the three day beef rib so stay on the lookout. Thanks for reading! Sorry about the drought in posts. I took a week off because I had family visiting, and it's a bit hard to cook for a crowd when you've got people underfoot. Today's offerings coming from cooking for a dinner party last week. I had all these fresh spices from the Indian grocery and I felt I should churn out another Indian themed bento. Lindsay from Apron Adventures once Grapefruit fairy now brings me a nice bag of Ataulfo Mangos. This of course played into my bento theme nicely and basically fixed my dessert. Big thank you to her for the beautiful mangos! It's very liberating cooking for my new audience. I've gotten a lot of restrictions lifted and my adventerous coworkers even requested to be hit with something spicy. Hopefully I don't disappoint with my Beef Vindaloo. I cobbled together a few versions and came up with this spicy dish that I slow cooked for eight hours. The beef was fall apart tender and the heat from the 40 thai bird chillies gave a kick that even I started sweating. This really came out more like a stew with the thinner sauce, I think many of the recipes called for finer cuts of onion and tomato puree to give more body to the sauce. I used golden potatoes hoping that the creamy texture (over the more mealy russets) would help thicken things up but that didn't happen. I'm very happy with the flavors that I conjured up just not the consistency. And yes I'll admit, just so I could quell my critics, I went ahead and dropped some Naga pepper sauce in this bad boy. Hopefully it's not so hot as to be inedible (tastes fine in my book) but should satisfy my chili heads. Next up, this is one of my favorite lentil/Dal dishes, Dal Makhani. This is a northern India dish from the provence of Punjab. Like many Indian dishes this is full of spices (thus flavor) and slow cooking was the order of the day. I think I need to invest in a pressure cooker, I usually try to cheat with canned beans but when it comes to some of these lentils there's no short cutting as finding them in cans is next to impossible. Anyhow, I figured this would be a nice addition to mellow out the heat I dished at my eaters. Originally I was going to make this a small side dish, but ended up with a ton more than I expected so that left rice as very small side portion today. I had some trouble with my rice, I think my rice cooker (I call her Ole Bessie) is on her last legs. I've had her since college and she's been really good to me. One button press and there's always perfect rice in the pot, but today, I smelled some electrical burny smell. I shall write a tribute to her if it comes to putting her to pasture. Finally we have a nice mango puree. I took some time to understand the noble mango since I was gifted with such a nice bounty. The varietal I got was the Ataulfo Mango, unlike the usual Kent mango which I usually use with Indian cooking. The flesh was a bit firmer (despite being perfectly ripe), the seed to the Ataulfo is also smaller than the Kent (compared to size) such that you yield a lot more mango fruit flesh than the Kent cousin. Here, I pureed the mangos in my gratuitously powerful blender and simply added a bit of sugar and cardamom powder and garnished it with a bit of almond for texture. Very simple and very tasty. I loved this bento. I'm so very glad I have a bunch of left over inferno hot curry. As always, thanks for dropping by and see you next time!